UNC Lineberger member and gynecologic oncologist Dr. Groesbeck Parham has worked in Zambia for the past 11 years and in Africa since 1985. Last year, he received a grant from the National Cancer Institute (NCI) grant to build a cancer-related research platform between UNC sites in Zambia and Malawi. 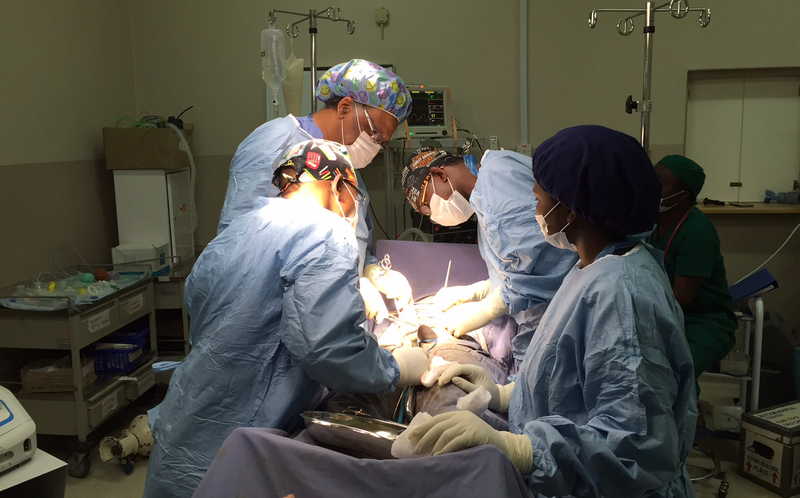 Now Parham has extended the reach of his program to Malawi, helping to train a physician there in radical hysterectomy to treat cervical cancer. Dr. Parham and Chinula perform surgery. Malawi and sub-Saharan Africa are “the epicenter of preventable cancer death,” said Dr. Chinula. A lack of screening services, late presentation to health facilities, high burden of infectious diseases, complex pregnancies and lack of human resources all play a role. With only one physician in Malawi trained to perform radical hysterectomy – the surgical procedure required to treat cervical cancer – women die in large numbers from the disease. Dr. Parham has been living and working in Zambia as a gynecologic oncologist for the past 11 years, and in Africa since 1985. On faculty at UNC OB-GYN and a member of UNC’s Lineberger Comprehensive Cancer Center, he received a National Cancer Institute (NCI) grant last year aimed at building a cancer-related research platform between the UNC sites in Zambia and Malawi. The NCI grant is as a supplement to the UNC Lineberger Global Oncology Program. With the program set in-motion, Dr. Chinula went with two other doctors to Lusaka to meet with Dr. Parham.